A compilation and expansion of all my Guitarist magazine ‘Rock Links’ columns. The book features new, unreleased licks, full biographies, in-depth information about how to incorporate each lick into your playing and many more extras not featured in the original Guitarist magazine columns. Includes 2 CDs. 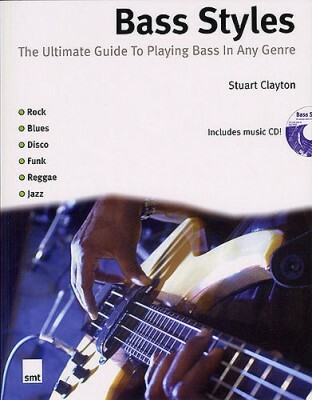 Stuart Clayton is the bass player in the Carl Palmer Band. He asked me to record the guitar parts for an accompanying CD for his latest book; this was the result! My first paid, professional session. Whilst I was a student at the ACM in Guildford one of my teachers, Jamie Humphries, saw one of my transcriptions lying around the office (as well as being a student there, I also taught and transcribed for the college). The transcription he saw was of a spoken vocal part; I’d taken the time to notate the exact rhythm and pitch of the spoken words. Impressed by the lengths that I’d gone to in order to notate the part accurately, he offered me a job transcribing for a company called ‘Total Accuracy’ who release transcription books with backing tracks. 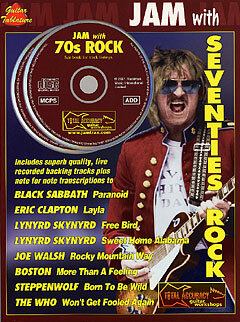 I transcribed and recorded two songs for the book; Paranoid by Black Sabbath and Born To Be Wild by Steppenwolf.